​​​​​​​ ​CANYON – It looks like the WTAMU buffalo herd is growing. West Texas A&M University (WT), know as the Buffaloes,​ announced that more than 10,000 students are enrolled for the fall 2017 semester, marking its first five-digit enrollment tally. A record 10,169 students were enrolled on the 12th class day—208 more than the same day last year, according to WT. 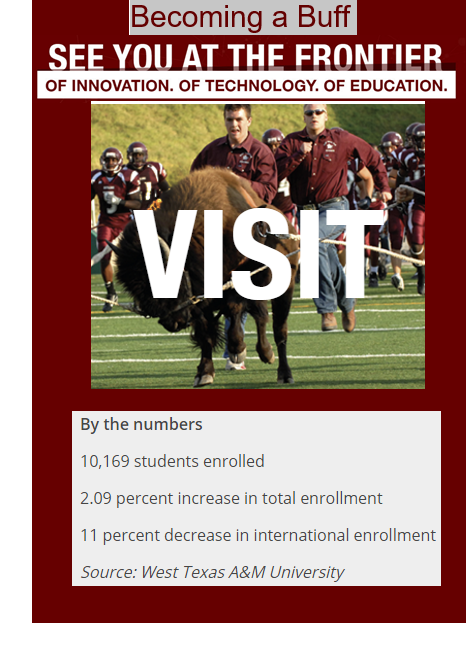 In 2012, WT topped a four-decades old enrollment peak and has posted enrollment gains each year since. The recent tally included 8,008 in-state students and 1,934 from outside Texas. The student headcount at WT’s Amarillo Center—which will soon be relocating to downtown Amarillo—is 257, and total class enrollment there is 363. The university recorded a slight uptick in undergraduate enrollment—7,477 this year compared to 7,428 last year. Graduate enrollment showed a larger gain this year, with 2,581 compared to 2,417 last year. Check education stories across Texas.